389 Beacon is located on the south side of Beacon, between Fairfield and Gloucester, with 387 Beacon to the east and 391 Beacon to the west. 389 Beacon was designed by architect Frederick B. Pope and built ca. 1869, one of ten contiguous houses built as five symmetrical pairs (377-379-381-383-385-387-389-391-393-395 Beacon), each house on an 18 foot wide lot and each pair united by a shared portico. 377-379 Beacon are one story higher than the other four pairs, and probably were built that way (they appear as such on the 1887 Sanborn map). Click here for an index to the deeds for 389 Beacon. On August 20, 1869, Frederick Pope acquired 389 Beacon from George Gibson. On March 19, 1870, 389 Beacon was purchased from Frederick Pope by Annie Louise (Lobdell) Motte, the wife of attorney Ellis Loring Motte. 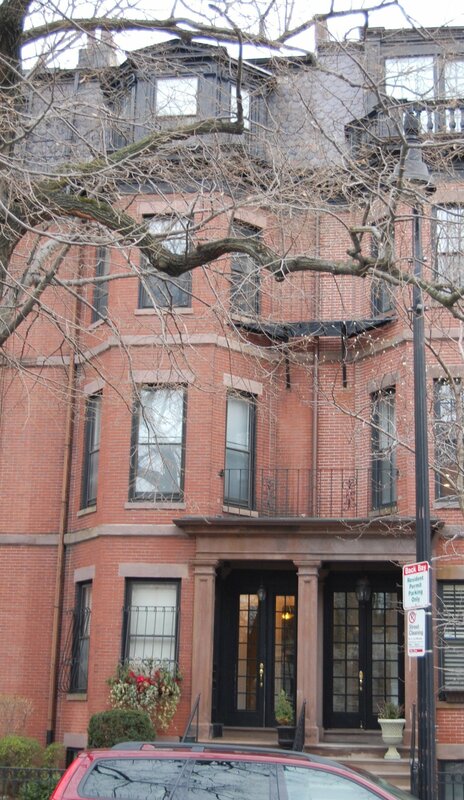 They previously had lived at 62 Shawmut. The Mottes continued to live at 389 Beacon during the 1889-1890 winter season, but during the next two seasons were living elsewhere, and 389 Beacon was the home of John Stetson and his wife, Katherine (Kate) (Stokes) Stetson. John Stetson was a banker, real estate investor, theatrical manager, and theater owner (he was the owner and manager of the Globe Theatre on Washington Street, destroyed by fire on January 2, 1894). Before they married, Kate (Katie) Stokes had been a well-known circus bare-back rider; she was injured in a fall from her horse and took up an acting career in New York City, where she met and married John Stetson in June of 1887. By the 1892-1893 winter season, the Stetsons had moved to 461 Commonwealth. They also maintained a home on Burgess Point in Beverly. He died in April of 1896 and she died in May of the same year. After their deaths, John Stetson’s will (which left his entire estate to Kate Stetson) was the subject of a highly-publicized, protracted, and ultimately unsuccessful challenge by Adah Richmond, an actress, who claimed that she had married him in 1871 and they had never divorced. Ellis and Annie Motte resumed living at 389 Beacon during the 1892-1893 winter season, and continued to live there during the 1893-1894 season. By the 1894-1895 season, however, they had moved to the Hotel Ludlow (southwest corner of Clarendon and St. James). In August of 1895, they purchased and subsequently moved to 138 Marlborough, a four unit apartment building. Annie Motte continued to own 389 Beacon and lease it to others. During the 1894-1895 winter season, 389 Beacon was the home of attorney William Allen Hayes and his wife, Margaret (Luquer) Hayes. They had married in August of 1894 and 389 Beacon probably was their first home together. By the next season, they had moved to 155 Bay State Road. By the 1895-1896 winter season, 389 Beacon was the home of Eunice F. (Rand) Clarke, widow or former wife of Charles Clarke, and her adopted daughter, Caroline Gardner Clarke. They previously had lived at 34 Newbury. They continued to live at 389 Beacon during the 1896-1897 season. 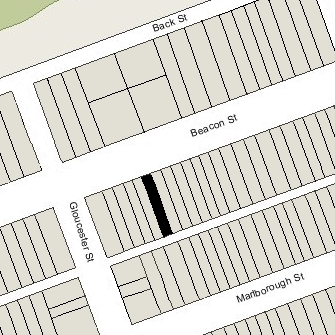 By the 1897-1898 season, Eunice Clarke (and probably Caroline Gardner Clarke) had moved to Trinity Court (southeast corner of Dartmouth and Stuart). Caroline Clarke married at about this time to Dr. James Washington Bartlett, a dental surgeon; after their marriage, they lived at Trinity Court. Caroline Gardner Clarke was a concert singer and music teacher, who maintained her studio at 407 Marlborough. After her marriage to James Bartlett, she continued her career and, in 1904, opened a music school, Sunny Hill, in Warner, New Hampshire, where she and her husband maintained their summer home. James Bartlett died in March of 1910. She resumed her singing career and was in London for a concert tour in 1914 when World War I broke out. She volunteered for the war effort and worked raising funds and collecting medical supplies for the troops. She dressed in a nun’s habit of deep purple and called herself “Sister Beatrice” so as to be immediately recognizable in the war zone and not trade on the name she’d made well-known as a performer. In 1915, she was accused of being a German spy, and later also accused of misappropriating funds. She spent the rest of her life seeking to clear her name. By the 1897-1898 winter season, 389 Beacon was the home of Susan Livingston (Tilden) Barnard, the widow of commission merchant George Middleton Barnard, and her grand-daughter, Mary Winchester Barnard (daughter of Joseph Tilden Barnard and Mary Winchester (Cunningham) Barnard, both of whom were deceased). They previously had lived in an apartment at 199 Marlborough, and prior to that at 106 Beacon. They continued to live at 389 Beacon until Susan Barnard’s death in February of 1899. By the 1899-1900 winter season, 389 Beacon was the home of real estate dealer John Perry Wise and his wife, Annie M. (Long) Wise. They previously had lived at 100 Sydney. They continued to live at 389 Beacon during the 1900-1901 season, but moved thereafter. By the 1901-1902 winter season, 389 Beacon was the home of Cora Lee (Clark) Rice, the widow of John Hamilton Rice, and their three sons: Alexander Hamilton Rice, II, a physician and geographer/explorer; John Clark Rice, a lawyer; and Arthur Noble Rice, also a lawyer. They previously had lived at 41 St. Stephen. John Rice married in December of 1905 to Katharine Smith Atkinson. They moved to an apartment at 224 Marlborough and then, in 1909, to 431 Beacon. Cora Rice and her other two sons continued to live at 389 Beacon during the 1906-1907 winter season, but moved thereafter. Hamilton Rice traveled abroad, probably to South America, and Arthur Rice moved to Nevada, where he practiced law. Cora Rice was living at 13 West Cedar in 1910. By the 1907-1908 winter season, 389 Beacon was the home of Davenport Brown and his wife, Marie (McKenna) Brown. They previously had lived at The Stratford at 31 Massachusetts Avenue. He was a real estate trustee. They continued to live at 389 Beacon during the 1908-1909 season, but then moved to 19 Brimmer. By the 1909-1910 winter season, 389 Beacon was the home of shoe manufacturer Charles Jonas Prescott and his wife, Evelyn Munroe (Livermore) Prescott. They previously had lived in Cambridge. They continued to live at 389 Beacon during the 1914-1915 season, but moved thereafter to Norwood. By the 1915-1916 winter season, 389 Beacon was the home of attorney Thomas Tileston Baldwin and his wife, Edith Perkins. They previously had lived in Chestnut Hill. They continued to live at 389 Beacon during the 1917-1918 season, but moved thereafter to an apartment at 259 Beacon. 389 Beacon was not listed in the 1919 Blue Book. By the 1919-1920 winter season, 389 Beacon was the home of attorney Lawrence Cushing Goodhue and his wife, Gertrude Munroe (Smith) Goodhue. They previously had lied at The Stratford at 31 Massachusetts Avenue. Initially, they leased the house from Annie Motte’s estate (she had died in August of 1910), and then purchased it from the estate on May 9, 1925. They also maintained a home in Beverly Farms. The Goodhues continued to live at 389 Beacon until 1947. They subsequently made their home in Manchester. On October 1, 1947, 389 Beacon was acquired from Gertrude Goodhue by Joseph F. Conlan and his wife, Sarah (Sally) Agnes (Fleming) Conlan. They previously had lived at 158 Bay State Road. He was sales manager at the Hotel Somerset. They continued to live at 369 Beacon in 1950, but moved thereafter to the Hotel Bradford at 275 Tremont, where he became general manager. On April 4, 1950, 389 Beacon was purchased from the Conlans by Frank C. Hanson and his wife, Ethel Warren Hanson, who operated it as a lodging house.. They previously had lived in Connecticut. On August 15, 1951, 389 Beacon was acquired from the Hansons by Helen Freda (Miller) Kaplan, the wife of Bernard I. Kaplan, an attorney. They lived in Brookline and operated 389 Beacon as a lodging house. On November 27, 1956, 389 Beacon was acquired from Helen Kaplan by her mother, Bertha (Cohen) Miller, the former wife of Eli (Elias/Elijah) Miller. She was a social worker with the Massachusetts Department of Welfare and lived at 449 Beacon. She continued to operate 389 Beacon as a lodging house. On July 6, 1959, 389 Beacon was acquired from Bertha Miller by Florence Beth Pockwinse, also a social worker and lodging house operator, who lived at 31 Brimmer. On October 1, 1962, 389 Beacon was acquired from Florence Pockwinse by Peter Kinder. In July of 1963, he applied for (and subsequently received) permission to convert the property from a lodging house into nine apartments. On July 1, 1970, 389 Beacon was acquired from Peter Kinder by real estate dealer Patrick J. Glynn. On August 1, 1985, 389 Beacon was acquired from Patrick Glynn by Barry P. Winer, trustee of the 389 Beacon Street Realty Trust. 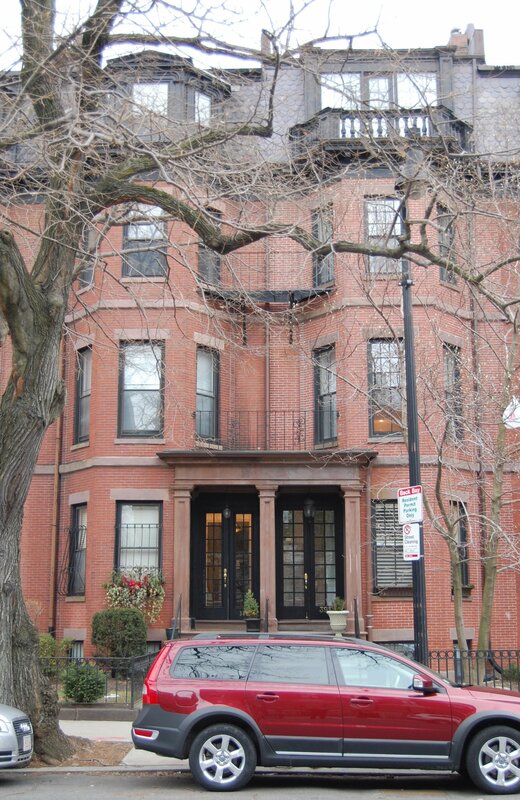 On December 16, 1985, he converted the property into nine condominium units, the 389 Beacon Street Condominium.